Per his military service record (regimental no. 4843), Robert Alexander Gordon Mitchell was born at Cobar, N.S.W. He gave his age as 27 years and 6 months, his marital status as married, and his occupation as labourer. His description on his Certificate of Medical Examination was height 5 feet 9 ½ inches tall, weight 154 lbs., with a fair complexion, grey eyes, and light brown hair. His religious denomination was Presbyterian. He claimed to have had no previous military service. A send-off was held on Thursday 28th October 1915 at the Court House Hotel in Cobar for Robert and his brother Walter Mitchell, Norman Francisco, and Andrew Lennox, and they were then cheered by many friends when they left Cobar by train on 30th October 1915 to join the A.I.F. Robert Mitchell completed his medical examination, and was attested with the other three men at Dubbo on 2nd November 1915, (the day the Coo-ees were at Lithgow). Robert and his brother Walter Mitchell, Andrew Lennox, and Norman Francisco then travelled to catch up with the Coo-ees, and were waiting to join the Coo-ee March when the Coo-ees arrived at Mt. Victoria two days later, on 4th November 1915. On his embarkation roll his address at time of enrolment was Cornish Town, Cobar, N.S.W., and his next of kin was listed as his mother, Mrs E. A. Mitchell, Cornish Town, Cobar, N.S.W. On 8th March 1916 Private Mitchell, along with his brother Walter, and many of the other Coo-ees, departed Sydney on the HMAT A15 Star of England, with the 15th reinforcements for the 13th Battalion. On 16th April 1916 Private Mitchell was transferred to the 4th Division Artillery at Tel-el-Kebir, and taken on strength of the 10th Field Artillery Brigade, and mustered Driver. On 22nd May 1916 Driver Mitchell was transferred to the 110th Australian (Howitzer) Battery. 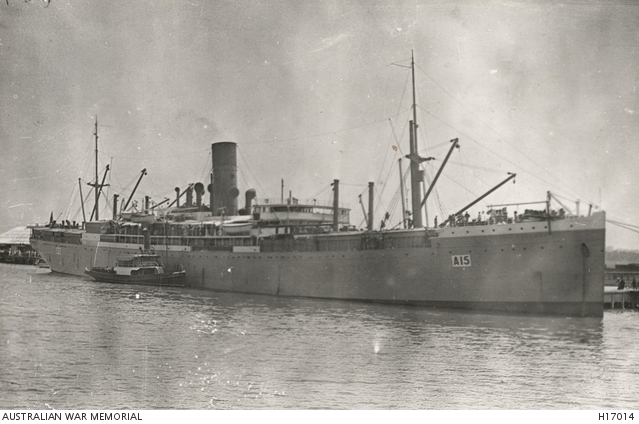 On 5th June 1916 Driver Mitchell left Alexandria aboard the HMT Oriana bound for France. He arrived at Marseilles on 13th June 1916. On 21st September 1916 Driver Mitchell was sent to the 1st Australian Field Ambulance with a hernia. On 30th September 1916 he was moved back to the 50th Casualty Clearing Station. On 3rd October 1916 he was admitted to the 3rd Canadian General Hospital at Boulogne, France. On 9th October 1916 he was transferred to the 26th General Hospital at Etaples, France. On 10th October 1916 he was placed aboard the Hospital Ship Stad Antwerpen at Calais for evacuation to England. On 11th October 1916 he was admitted to the Queen Mary’s Military Hospital at Whalley, England. He was discharged from hospital and went on leave from 12th February 1917 to 27th February 1917, then reported to the No. 1 Command Depot at Perham Downs, England. On 30th April 1917 Driver Mitchell was charged with being absent without leave from noon on 25th April 1917 till 1545 on 28th April 1917. He was awarded 7 days confined to camp and fined 4 days pay. Driver Mitchell departed Southampton, England, on 19th June 1917. He arrived at the Australian General Base Depot at Rouelles on 20th June 1917. He rejoined the 10th Field Artillery Brigade on 5th July 1917. On 22nd January 1918 Driver Mitchell went to Paris on leave. He was due to return to his unit on 31st January 1918, however did not return until 4th February 1918. On 8th February 1918 Driver Mitchell was sent to the 2nd Casualty Clearing Station sick. On 9th February 1918 he was placed aboard the 37th Ambulance Train and moved to the 39th General Hospital at Le Harve, France, where he was admitted on 12th February 1918. On 12th April 1918 Driver Mitchell was court martialed for failing to obey Hospital Orders in that on 4th April 1918 whilst a patient at the 39th General Hospital was gambling contrary to Order 19 which forbids gambling. He was found guilty and awarded 10 days Field Punishment no. 1. Driver Mitchell was discharged from hospital on 21st April 1918 and sent to the Australian General Base Depot at Le Harve, France. He rejoined his unit on 3rd May 1918. On 10th May 1918 a Field General Court Martial was held where Driver Mitchell was charged with when on active service being absent without leave from 31st January 1918 till 4th February 1918. He was found guilty and awarded 21 days field punishment no. 2 and fined 120 days pay. On 25th August 1918 Driver Mitchell went on leave. He rejoined the 10th Field Artillery Brigade on 14th September 1918. On 28th January 1919 Driver Mitchell went to Paris on leave. He returned to his unit on 11th February 1919. On 4th March 1919 Driver Mitchell marched into the Australian General Base Depot at Le Harve, France, to commence his return to Australia. On 13th March 1919 he departed France, arriving at Weymouth on 14th March 1919. He then marched into the No. 4 Command Depot. On 1st May 1919 Driver Mitchell departed England aboard the Transport China bound for Australia. Australian War Memorial. First World War Embarkation Rolls, Robert Alexander Mitchell, HMAT Star of England A15, 8th March 1916. Per his military service record (regimental no. 4842), Walter James Mitchell was born at Cobar, N.S.W. He gave his age as 37 years and 5 months, his marital status as married, and his occupation as Contractor. His description on his Certificate of Medical Examination was height 5 feet 7 inches tall, weight 147 lbs., with a fair complexion, grey eyes, and light brown hair. His religious denomination was Presbyterian. He claimed to have had no previous military service. A send-off was held on Thursday 28th October 1915 at the Court House Hotel in Cobar for Walter and his brother Robert Mitchell, Norman Franciso, and Andrew Lennox, and they were then cheered by many friends when they left Cobar by train on 30th October 1915 to join the A.I.F. Walter Mitchell completed his medical examination, and was attested, at Dubbo on 2nd November 1915, (the day the Coo-ees were at Lithgow). Walter and his brother Robert Mitchell, Andrew Lennox, and Norman Francisco then travelled to catch up with the Coo-ees, and were waiting to join the Coo-ee March when the Coo-ees arrived at Mt. Victoria two days later, on 4th November 1915. On his embarkation roll his address at time of enrolment was Cobar, N.S.W., and his next of kin was listed as his wife, Mrs H. G. [Henrietta] Mitchell, C/o W. Mitchell, Cobar, N.S.W. His rank was listed as Acting Corporal. A farewell was held at the Masonic Hall in Cobar at the Masonic Hall on Friday 3rd March 1916 to bid farewell to Corporal Walter Mitchell, and his brother Private Bob Mitchell, and Private Fred Duncan. The Western Age reported that ‘Corporal Walter Mitchell, on rising to respond on behalf of himself and his comrades, was loudly cheered’, and in a ‘very affected speech he said words failed to thank to people of Cobar for all the kind remarks and their nice presents’, and that they would ‘cherish them wherever it was their lot to be sent’, and that it was a ‘great wrench for him to go, but he realised duty had to be done, and he was going to do his little bit’. On 8th March 1916 Acting Corporal Mitchell, along with his brother, and many of the other Coo-ees, departed Sydney on the HMAT A15 Star of England, with the 15th reinforcements for the 13th Battalion. He arrived in Egypt on 11th April 1916. On 16th April 1916 he was transferred to the 4th Division Artillery at Tel-el-Kebir, and taken on strength of the 10th Field Artillery Brigade, with the rank of Gunner. On 22nd May 1916 Gunner Mitchell was transferred to the 37th Battery. On 5th June 1916 Gunner Mitchell left Alexandria aboard the HMT Oriana bound for France. He arrived at Marseilles on 13th June 1916. On 24th October 1916 Gunner Mitchell was taken on the strength of the 10th Field Artillery Brigade. On 25th October 1916 Gunner Mitchell was appointed as a Temporary Bombardier. On 9th March 1917 Temporary Bombardier Mitchell was sent to the 4th Australian Field Ambulance sick. On 12th March 1917 he was moved back to a Casualty Clearing Station, and reverted to the rank of Gunner. On 19th April 1917 he was placed aboard the 20th Ambulance Train, and evacuated to the 14th Stationary Hospital at Boulogne, France. On 22nd April 1917 Gunner Mitchell was placed aboard Hospital Ship Jan Breydel for evacuation to England, with meningitis. On 23rd April he was admitted to the Addington Park War Hospital outside London, England. On 18th May 1917 Gunner Mitchell was transferred to the Royal Herbert Hospital at Woolwich, England. On 8th August 1917 he was transferred to the 1st Australian Auxiliary Hospital at Harefield Park, England. Gunner Mitchell was discharged on the 18th of August 1917, and sent to the No. 2 Command Depot at Weymouth, England. On 27th September 1917 Gunner Mitchell departed England aboard the H.T. Suevic bound for Australia, for medical discharge with Myalgia debility after C. S. Fever. He arrived in Australia on 20th November 1917. Private Mitchell was welcomed home and presented with a silver cup by the people of Cobar, and the Red Cross Association, at the Masonic Hall in Cobar on 5th December 1917. Private Mitchell was discharged medically unfit on 31st January 1918. Australia War Memorial. First World War Embarkation Rolls, Walter James Mitchell, HMAT Star of England A15, 8th March 1916.